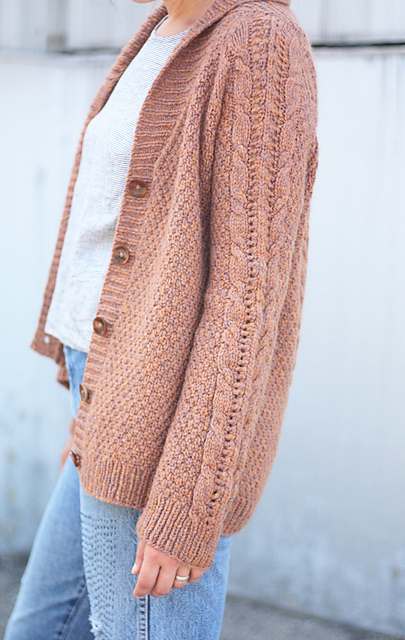 Crazy for Cozy Cardigans – Old Salt Craft Co. I need to come to terms with an obsession. Let me sing the praises. I can wrap myself up in a cardigan and feel embraced by my own knitting. Is it hot in here? Let me quickly and easily take off a layer to get more comfortable. Oh no, is that a breeze? Allow me to reach for this warm, soft hug of a garment and put it back on. A garment simply could not be more stylish (layering! ), comforting, and practical. Period. 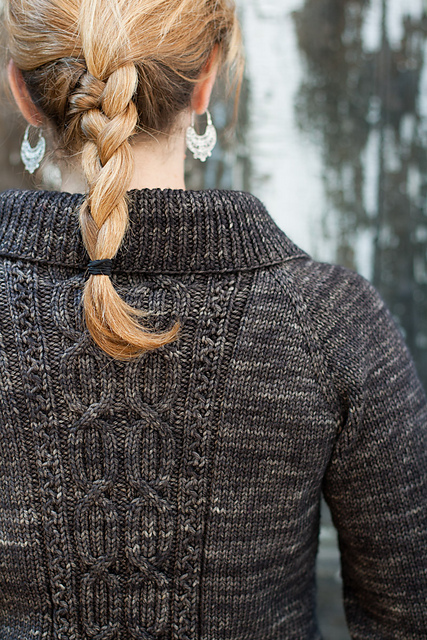 The moment I first saw Andrea Mowry’s “Oxbow Cardigan,” I needed to cast it on immediately. I spotted it on an Instagram photo of hers and searched her Ravelry to see if it was a design I somehow managed to miss, but alas it wasn’t there. A few weeks later…I spotted it again in another of her photos (clearly, she appreciates the cozy cardigan as much as I). This time, she mentioned in the description that it would be released on Ravelry soon. The MOMENT it was released (okay, soon after I woke up on the day it was released), I purchased it and ordered the yarn. I quickly learned that actually the pattern had been available for almost a year in the book “A Sense of Place” by Tolt Yarn and Wool, but that’s okay. I was able to bring the project with me to Pete’s family cabin in Canada during our vacation, and it was the perfect “week at the lake” project. Cozy, comforting, woolly. As you can see by the ribbed collar, I haven’t even had the patience to block it yet (notice how it’s rolling out a little around the body where it should lay flat), but that’s just how over the moon in love I am with this garment. As much as I really do adore a lot of the pieces I’ve made, for some reason, I am so attached to this one that I can’t quite describe the feeling. There’s something about this cardigan that makes me feel like “a real knitter.” It’s warm and woolly and practical in a timeless way. And so… I’ve be stalking more cozy cardigans, and somehow in the last week my Ravelry queue has gone from 30 patterns to 50+. 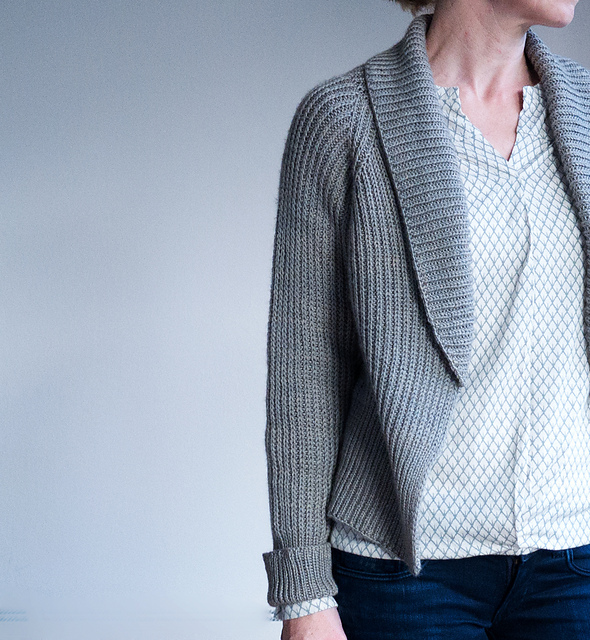 Something tells me that there is steeking in my future, because I really prefer to knit in the round as opposed to flat, but I’m definitely more inclined to make cardigans rather than pullovers right now. First, the color of Amy’s is everything right now. She used Berrocco’s “Catena,” in a very new color called “Cat’s Eye.” It’s a hard-to-find color right now, but I’m hoping my LYS can help me get my hands on the 10 skeins I’ll need. There are a couple major selling points of this pattern: 1) it’s FREE on Ravelry 2) it uses BULKY yarn, making it a quick knit! and 3) the sizes are curvy-girl-friendly (e.g. an XS is a 40″ bust)! I actually bought the yarn for this one recently. I plan to use Asylum Fibers worsted weight in the colorway “Housecoat.” As you can see, it’s pretty similar to Ausable, but it uses worsted weight instead of bulky. Can you tell I like textured fabric with shawl collars?? Again, I’m a sucker for that shawl collar and textured fabric! This time, the texture is the result of one-color brioche. I haven’t brioche-ed since I first learned last spring, and can’t say I actually remember how, but I’m sure after completing this beauty, I’d be a pro. This one has been very popular, and probably because it just looks so wearable! The slim fit and V slip stitches (I’m assuming that’s how those V’s are made) really is very flattering. I’ve been looking for an excuse to get on the mohair craze, and I think this would be perfect. This type of fluffy, housecoat-esque cardigan seems to be very on-trend in the fashion world right now (at least according to the fashionable people I follow on Instagram). And of course, there are many, many others in my queue, but those are just a few that I’m especially fawning over. Enjoying the process while vacationing in Canada at Pete’s family cabin. Next A Year of Garment Knitting – What’s Next?